For the past several months, I-CAR and subject matter experts from vehicle makers, collision repairers, insurers, and tool and equipment makers have been meeting to develop, update, and publish an I-CAR best practice on Advanced Driver Assist Systems (ADAS) Collision Repair Diagnostic Processes. This best practice is designed to be used in conjunction with the “I-CAR Best Practice: Collision Repair Diagnostics Definitions,” published in October 2016. 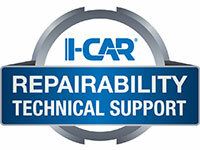 Before any repair decisions are made, access to OEM repair information is required. Diagnostic Trouble Codes (DTCs) do not identify which part needs to be replaced, rather DTCs are a piece of the diagnostic process that will lead a trained and qualified technician to the correct test to accurately diagnose the damage. Ensure that you have proper battery support when scanning. Although this process was developed to cover Advanced Driver Assist Systems (ADAS), the process can be applied to other electronic systems, such as restraints, adaptive lighting, and other systems that may require calibration and/or aiming. Check for Malfunction Indicator Lamps (MILs) and/or information display messages. The 12-volt electrical system must be enabled to identify any MILs. Not all systems will illuminate MILs, even if there is damage to that system. Document any MILs and/or information display messages. Identify Advanced Driver Assist Systems (ADAS). (Collision Braking, Lane Keep Assist, Adaptive Cruise Control, etc.). Document potential damage to ADAS, ADAS mounting location(s), damage that may affect ADAS, or parts that will need to be R&I near ADAS. Identify calibration/initialization/aiming requirements for ADAS parts, including required calibration/initialization following R&I. Enablement/disablement may be required for some calibration procedures. If it is turned off, system may not be able to be calibrated. Systems that can be enabled/disabled should to be documented, so that a system is not turned on when customer wants it off. A pre-scan is not possible if the 12-volt electrical system and vehicle communication networks are disabled or cannot be maintained throughout the scan. If a pre-scan is not possible because of vehicle damage, it should be done as soon as repair progress allows it to be done safely. Document DTCs and other data. Access OEM information to identify system(s) affected by DTCs. Determine likely related and unrelated DTCs. Perform all required calibration/initialization/aiming steps, following OEM published procedures. Some systems will require the vehicle to be driven to perform calibration/initialization/aiming within the required driving parameters. Some systems will not detect issues within the system until the vehicle is driven within the required driving parameters. Some systems will require special tools and/or aiming equipment for calibration/initialization/aiming. Some systems will require both. If related DTCs return, begin OEM published diagnostic process to determine error.